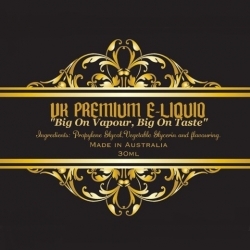 VK Premium E-liquid There are 209 products. VK Bubble Gum Flavor E-liquid 12mg 30ml gives you great vapor and great flavor. Our brand e-liquid is a very high quality product, customer satisfaction guaranteed, so buy now. Note: Please purchase our brand e-liquid separately from other e-liquids. This product ships by Australia Post and is made in the USA, okay to ship with other e-cigarette products. VK Banana Split Flavor E-liquid 12mg 30ml gives you great vapor and great flavor. Our brand e-liquid is a very high quality product, customer satisfaction guaranteed, so buy now. Note: Please purchase our brand e-liquid separately from other e-liquids. This product ships by Australia Post and is made in the USA, okay to ship with other e-cigarette products.